Are Your Lights Making You Tired? 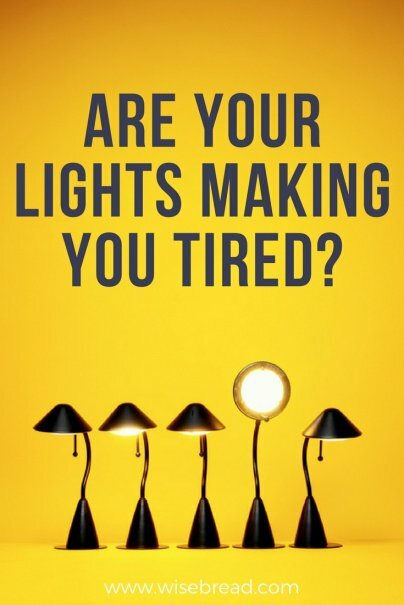 Home » Life Hacks » Productivity » Are Your Lights Making You Tired? It's the middle of the afternoon, and you've reached The Slump. You know, that time in the afternoon, usually about two hours after lunch, when all you want to do is curl up on the floor under your desk and take a nap. Light doesn't just help you stay alert, it also aids in disease prevention, hormone balance, mental health, sleep cycles, work productivity, and much more. Each type of light can have positive and negative effects on your body, depending on when you are exposed to them. There is research that finds natural lighting to be better at improving work productivity, mood, and alertness. Subjects in one study "felt significantly more alert at the beginning of the evening after the [daylight] condition, and they became sleepier at the end of the evening after the [artificial light] condition..." Researchers found that "even short-term lighting conditions during the afternoon had an impact on cognitive task performance in the evening." If you are having trouble staying alert during the afternoon while working, try to sit near a window as often as possible, turn off the overhead lights unless absolutely necessary, or take a break outside in the sun during the afternoon to boost your mental and physical capabilities for the afternoon. If natural sunlight is not possible, you can mimic daylight with a compact fluorescent (CF) light bulb. When the right type is purchased, these bulbs can produce the same amount of light as natural sunlight. When you are buying CF bulbs, be sure to look for ones that measure 5,000 Kelvin. This is the measure of light that daylight produces. Some bulbs will claim to mimic sunlight but measure a much lower Kelvin. Blue light, like that of which is emitted off of tablets, smartphones, and televisions, has been found to increase alertness. This light, when viewed in the evening, can prevent a person from falling asleep quickly and can interfere with sleep patterns during the night. Many people leave a television on in their room during the night as they sleep for background noise. However, this habit can actually have a negative effect by causing one to have difficulty falling asleep and staying asleep throughout the night. There is a time and place for blue light, though. Exposing yourself to a lamp with a blue light bulb in the morning upon waking can keep your hand off the snooze button and provide you with an easy way to become alert first thing in the morning. Blue light throughout the day can aid in good sleep cycles at night. If you are in need of a pick-me-up to get through your day, you can try blue light therapy using your smartphone or tablet. Blue Light Therapy App on iTunes or Blue Sleep Therapy in the Google Play store are two apps that could help you when you are feeling sluggish. On the opposite side, if you struggle with going to sleep at night and you want to decrease your exposure to blue light, you can order blue light blocking glasses on Amazon and wear them while working with electronics at night. You can also download a program called f.lux to your computer. This program will decrease the amount of blue light in your screen as the day moves into night. This will help if you need to work in the evenings right before bed. Red light therapy has become more popular in recent years as research has begun to find that it can have a positive effect on the treatment of acne as well as with the aging process. There is evidence that regular exposure to infrared lighting can reduce wrinkles and fine lines, decrease blemishes and acne, slow down the aging process, and more. Red light therapy is typically found in salons, but some dermatologists are using it more frequently as well. Therapy consists of sitting underneath the lights for a short time on a daily basis and then tapering down the number of sessions until only one or two a week are needed. While this technology isn't readily available for the home, it may be beneficial to seek out if you are looking to treat acne, diminish scars, or look younger. There aren't many instances when artificial light is good for you. Generally speaking, artificial lighting has been linked to many mental health problems, diseases, alertness, and productivity issues. There are, however, a small number of people who benefit from artificial light therapy for the treatment of seasonal affect disorder (SAD). This syndrome causes depression in some individuals during the months when sunlight is at a premium. Their bodies require more sunlight and exposure to light boxes with artificial lights for 30 minutes a day can improve their symptoms. The type of lighting we encounter during the day can be wreaking havoc on our internal clocks, sleep cycles, mental health, physical health, alertness, and so much more. With the right planning, we can reduce the negatives effects of the wrong lighting and improve our lives with the correct placement of the right types. Have you improved your mood, alertness, or outlook by adjusting the lighting? Please share what works for you in comments! Great article, Linsey! I never knew the lighting can play such an important role in my productivity. However, I did notice that if I need to work on the computer at night, leaving only one light bulb on (usually there 2-3 bulbs on at the same time) and relying on the light coming from the screen helps me stay alert. Too much artificial light makes me feel more drowsy.